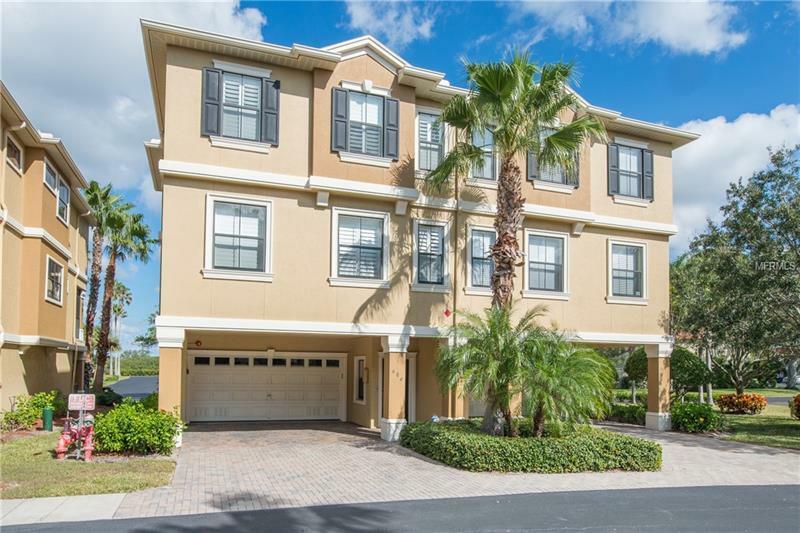 WATERFRONT Move In Ready Townhome in Dunedin with Water views! Beautiful 3 story Townhome located in Mediterranean Manors that is located at the edge of St. Joseph Sound on the Intercoastal waterway, this property has its own private sandy beach and waterfront park. Beautiful UPDATED Waterview Townhome. Updated Kitchen with All new Chef Collection edition stainless steel appliances, new new Granite & paint, new garbage disposal, New Kohler faucets & sinks New LED through the house with new dimmer switches, new garage door opener with remote WiFi, ADT Pulse, WiFi Ac access controlled by internet, new ceiling fan in the master. Extras include, private elevator, home stereo surround sound in living room & master bedroom, covered parking for two additional cars with an oversized two car garage. The family room has hardwood floors and features an open floorplan has sliders that open to the screened balcony. This home also features plantation shutters, crown molding, no carpet and so much more! Assoc fees include insurance, cable, water/sewer, trash, pool, yard service including trimming weeding & blowing leaves weekly, building Maintenance such as roof repair, pest control, painting & cleaning the outside of the home is included, tennis, shuffle board, workout facility, pool, ping-pong, library, private park with beach access, boat ramp, Ozona boat dock is walking distance, Caladesi island are a short walk or bike ride away. Bike trails mins away. Large Dogs are OK.